High accuracy Low pulsation multi channels peristaltic pump -Peristaltic pump,dispensing peristaltic pump,programmable peristaltic pump manufacturer - Chuangrui precision pump Co., Ltd.
GS600/LP25-6 filling system ,with max flow 4 L/min for each head . suitable for high precision and low pulsation filling . CR peristaltic pump filling system are based on bulk filling production requirment . which can meet production line with Conveyor belts, photoelectric switches, sensors, etc. *Accurate angle control technology for high precision filling. *Color touch screen friendly interface dynamic displaying working state default parameters and system configuration at the same time. 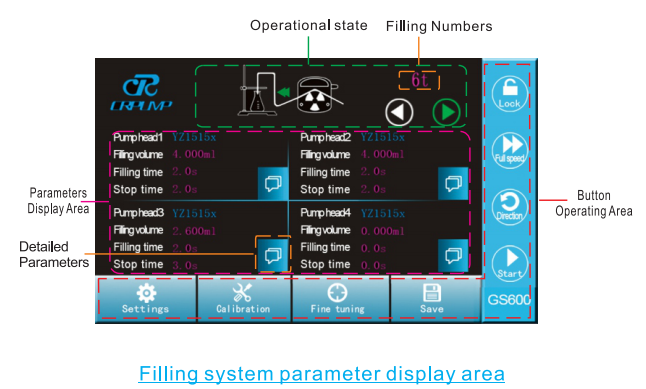 *Online calibration function enables the intelligent calibration for the filling quantity before production. *Guarantee the filling precision and increase your working efficiency. *Online fine tuning function convenient to calibrate or fine tuning the filling units during the productions to avoid any error in case the fatigue or elasticity decreased of the tubing. *It is available for expanding the filling units from one controller freely. *Can save 12 sets of common filling modes to save time and increase the work efficiency. *Stop automatically once there was no container for the fluid to avoid any error during the operations. Advantage of CR peristsaltic pump. replaceable tubes allow you to switch from one liquid to another in the shortest amount of time. The calibration function can ensure the filling accuracy for each dose .The suckback function prevents liquid (reverse): in the dispense mode, after the end of the direct cycle, the return stroke is initiated to prevent the liquid from flowing out of the pump tube during the stop. CR peristaltic pump can be used with a variety of products and can be used in a variety of industries. After the power is turned off and on, the control system maintains the current settings (pump head tubing model and other parameter ). CR peristaltic pump with good sealing: It has good self-priming ability and can be idling to prevent backflow. For different customer’s requirement .now for the Ultra filling system GS600 series we have 2 programme . 3, T is for same volume setting for each driver . F is for different volume setting for each driver . 5, pump head model, according to the existing pump head model added. Noted : This recommendation is for reference only, and the actual delivery configuration is subject to the recommendation of the salesperson. LP25-6 easy load peristaltic pump head is our company aims at filling requirements of high precision users and on the basis of the original equipment to newly developed production . a kind of low pulsation and high precision special peristaltic pump head after widely soliciting the views of users. It is suitable for high precision and medium flow filling. The pump head is of all metal structure, high mechanical strength and the shape adopts streamlined design, sturdy and beautiful, and easy to install. The two group of 304 stainless steel roller design with phase difference complementary can make fluid peaks and troughs complement each other to effectively reduce the fluctuation of the fluid and can be installed with double “Y” hose. And the flow and hose pressure is higher than the ordinary pump head. The pump head adopts the humanized design that the pressure can be adjusted fine, which ensures the transmission and filling accuracy of the fluid more effectively. CR peristaltic pump Ultra Filling system GS600 series with 5-inch industrial-grade true color LCD display and control. Smarter and more friendly. All working data can be easily set on the panel. The peristaltic pump Ultra Fill system can store up to 12 filling settings data for different filling volumes. With panel lock function to avoid erroneous operation. With online fine-tuning, it quickly reduces fill errors. With calibration function to ensure the high precision of the filling. With full speed capability to quickly replenish and empty pipes. With direction reversal, you can easily change direction. It has a bottle-stopping function and can be used with the production line. With external control function, it can be used together with the conveying sensor. The peristaltic pump Ultra Filling system GS600 series also accepts custom program customization and channel number customization. Peristaltic pumps are widely used in laboratories and scientific research institutions; chemical industry; construction industry; mining, metallurgy industry; paper industry; paint industry; food and beverage industry; ceramic industry; water treatment industry; biopharmaceutical industry; agricultural hydroponics industry; Equipment industry; industrial washing machine matching; packaging machinery industry, etc. Pharmaceutical industry : Pharmaceutical factory . Diagnostic reagent dispensing . machinery supporting for Filling machine / Dry granulation / Coating machine / Fermenter / Centrifuge, etc. Cosmetics Industry: For filling Perfume/Essential Oils/Lotion/Mask/ nail polish etc. Environmental protection: Flue gas analysis/Water quality monitoring/ COD/BOD etc. Packaging, protection:sealing and gelatinize machine, For adding glass fiber antistatic agent/ Wire coating/mechanical parts oiling .etc. Cleaning: Washing machine Dishwasher (delivering detergent, etc.) etc.